What can high profile Span-Track do for me? The channel of the high profile track rests on top of the beams of existing pallet rack. This allows the product to be used in non-standard pallet rack that isn’t compatible with other types of carton flow track, and will work on any pallet rack in any given distribution center, even if the brands and types are mismatched. This is ideal for retrofitting facilities that have a mix of racks, used racks, or older rack that is difficult to identify. 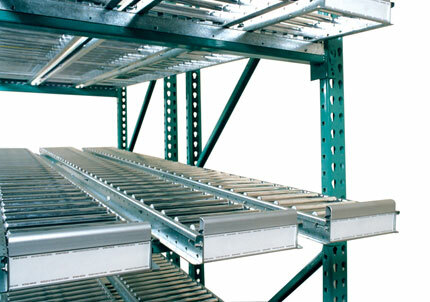 High profile Span-Track can extend beyond the front face of the rack, giving you an extra 24 inches of carton flow while maintaining full capacity. This is ideal for order picking applications where a lane of carton flow is needed beneath a pick conveyor line that would otherwise be blocked or impeded by the conveyor. Similarly, high profile Span-Track is often used for return lanes for empty boxes or totes at kitting or sub-assembly workstations. The extended track allows workers to easily deposit cartons and totes for return without risk of injury. Span-Track shines in each picking applications that demand a high level of picking accuracy. Because the Span-Track extends beyond the front load beams of pallet rack, its tracks can be knuckled to better present the picker with the contents of the tote or carton. Pickers can see individual picks as they make them, eliminating time wasted rummaging through cartons or picking incorrect products. It’s important to remember that because high profile Span-Track rests on top of the pallet rack beam, the tracks eat up valuable vertical space. If you’re looking to flow tall cartons or even stack more than one carton, high profile may not be the best fit for your needs. Consider low profile flow tracks for that situation. High profile is available in both roller lanes and wheel beds. Roller lanes are ideal for operations where there is a low level of product or carton size variance. They provide 300% more product contact than their plastic wheel competitors. This goes a long way in preventing imprinting on your cardboard cartons, making sure your products flow as easily as possible. Wheel beds are great for operations where flexibility is key, as the beds create an entire level of carton flow and do not require dedicated lanes. Span-Track utilizes what UNEX has coined “Hex Hub wheels,” specifically designed to reduce friction and provide optimal flow. High profile Span-Track also comes in 98, 99, and 100 series versions, each rated for different capacities. Whether you need to flow 35 pounds or 100, there is a version of Span-Track designed just for you. How do I install high profile Span-Track? Installing high profile Span-Track is an easy process (as demonstrated in the video below) and only requires a drill with a hex head, a retainer angle, and the hardware included with your Span-Track. First, you want to set your front beam at the desired discharge elevation, lower than your rear beam. Remember: an optimal flow of cartons requires the front beam to be one inch lower than the beam for every foot of rack depth. Next, you must attach the retainer angles included with your Span-Track. Your retainer angles should be approximately 1.5” shorter than your nominal beam size. These can be screwed in using your drill and the included Tek screws. The screws should be installed at a minimum of two feet apart. Now drop the Span-Track on the retainer angles. The channels of the track should drop between the teeth of the retainer angle. To secure the Span-Track to the rack, you must slide the lock arm through the hole at the end of the track and past the teeth of the retainer angle. Flipping the end of the lock arm over the tooth will secure the track. Where you insert the lock arm will depend on where your high profile Span-Track hangs over the rack. If the front of the track hangs over the front of the rack, secure the lock arm in the rear. Secure it in the front if the track hangs over the rear of the rack. If your track hangs over both front and back, you need only secure the lock arm in the rear.